Anne Zouroudi. El pecado de Midas. Barcelona: Duomo, 2010, 336 pages. Translated by Marta Pino Moreno. ISBN: 978-84-92723-42-3. 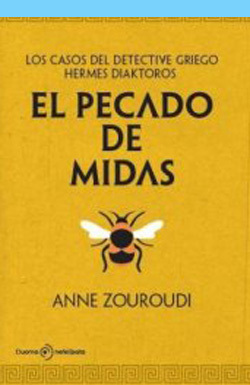 Spanish translation of the original title: Anne Zouroudi. The Taint of Midas. Bloomsbury, 2011. Published in Spanish by Duomo Ediciones.